The U.S. attorney’s office said it intends to retry the former Nassau County executive and his wife. The judge set a June 28 status conference to schedule a new trial. "Words can't describe the emotional pain and hurt and suffering that a trial puts on one and one's family," Edward Mangano said. This story was reported by Nicole Fuller, Robert E. Kessler, Chau Lam, Bridget Murphy and Emily Ngo. It was written by Ngo. 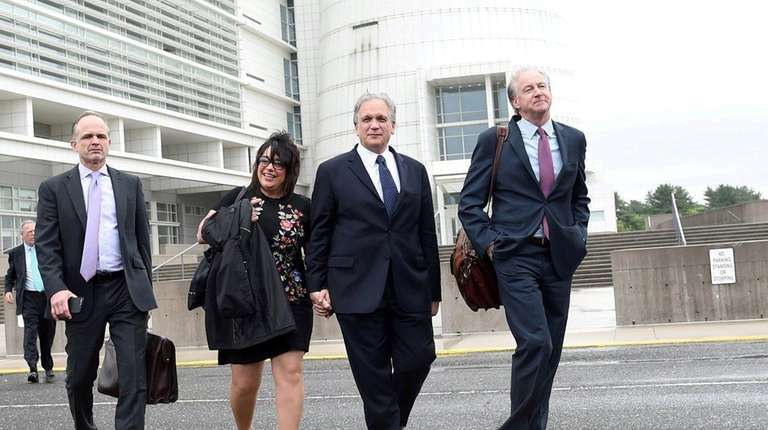 A federal judge declared a mistrial Thursday in the corruption case of former Nassau County Executive Edward Mangano and his wife, Linda, who prosecutors said benefited from bribes from a longtime friend and restaurateur. Prosecutors issued a statement saying they intend to retry the Manganos. 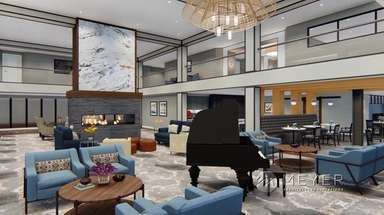 They had sought during the trial’s 12 weeks to show Edward Mangano exploited his public office to boost Harendra Singh’s businesses in exchange for such perks as a no-show job for Linda Mangano paying $450,000 over the course of four years. 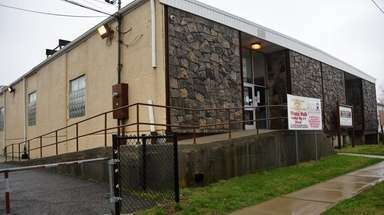 But after nine days of deliberations, the jury failed to render a verdict on either Mangano. A note from the foreman shortly before 1 p.m. prompted U.S. District Judge Joan M. Azrack’s decision to declare a mistrial. “I can no longer carry-out my duties as a juror. I wish to be excused,” wrote Marc Tambassopoulos, 29, of Hicksville, an NYPD officer. The Manganos greeted the end of the trial with elation. They held hands as they approached reporters outside the Alfonse M. D’Amato U.S. Courthouse in Central Islip. Edward Mangano said that Psalm 35 from the New International Version of the Bible had been with him from the moment he was accused to Thursday’s mistrial declaration. “Contend, Lord, with those who contend with me; fight against those who fight against me,” the passage begins. What do you think about the mistrial? Linda Mangano, who inside had embraced one of her sons and repeated that she loved him, similarly thanked her family and friends for their support. “I am grateful. I am so grateful,” she said. Though they celebrated Thursday, they and their defense teams acknowledged the looming prospect of a retrial. Azrack scheduled a June 28 status conference to set a new trial. “The U.S. attorney’s office intends to retry the Manganos,” Eastern District spokesman John Marzulli said, declining to comment on the mistrial. Singh, who had pleaded guilty to bribing Edward Mangano and served as prosecutors’ star witness, would aid the government again, said his lawyer, Anthony LaPinta of Hauppauge. The trial of Edward and Linda Mangano and their one-time co-defendant, former Oyster Bay Town Supervisor John Venditto, began March 12 with jury selection just before a snowstorm forced court to close the following day. 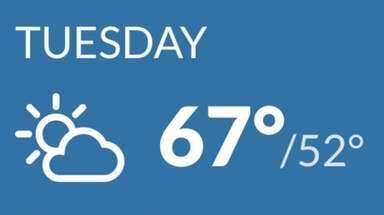 Sixty prosecution witnesses, about 1,100 pieces of evidence and nine days of jury deliberations later, it concluded Thursday after the seasons had turned from winter to spring. One week ago, the jury acquitted Venditto on all 27 corruption-related counts against him. On Tuesday, a juror failed to report for duty and sent both a note from her doctor and a note giving insight into the deliberations process. Keating said the latter communication pointed to a “toxic” environment among jurors rife with cursing and name-calling. Juror No. 5 was replaced with an alternate and deliberations restarted. On Wednesday, the seven women and five men of the jury said they were deadlocked, and Azrack asked them to continue deliberating. Keating and Carman made motions for mistrials on Tuesday and Wednesday. Azrack denied both. Tambassopoulos, Juror No. 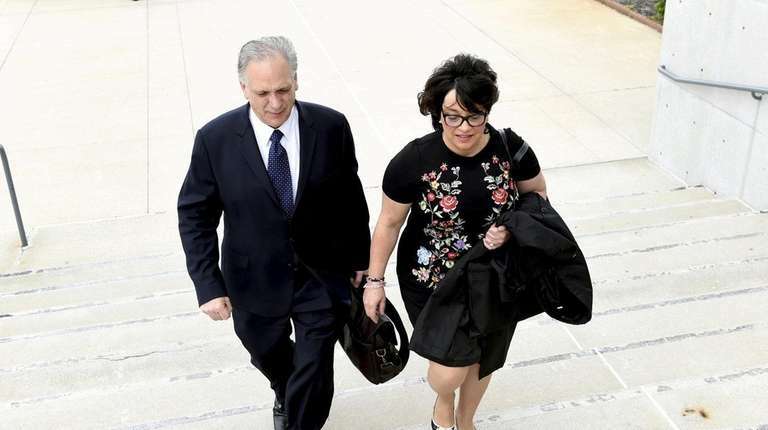 2 and the foreman whose note came just before the mistrial call, said Thursday that jurors were leaning toward acquittal for Linda Mangano and were “evenly split” on Edward Mangano. He said he sought to be dismissed because he felt some of his fellow jurors wouldn’t compromise. 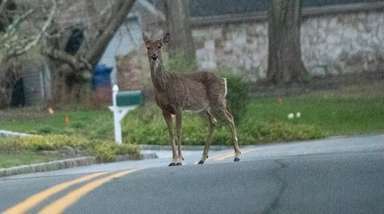 He disputed Juror No. 5’s report of hostile deliberations. Prosecutors sought to make the case that Edward Mangano accepted from Singh free meals, free vacations to destinations that included the Caribbean, two chairs each valued at more than $3,000, a $7,300 luxury watch for his son, hardwood flooring for his home and the no-show job for his wife. They said Mangano, in exchange, steered to Singh two lucrative county contracts and pressured Venditto to secure for Singh more than $20 million in town-guaranteed loans. Edward Mangano, 56, faced seven counts that included charges of federal program bribery, honest-services wire fraud, extortion and conspiracy to obstruct justice. Linda Mangano, 54, faced five counts that included conspiracy to obstruct justice, obstruction of justice and making false statements to the FBI — all in relation to the agency’s probe of her job with Singh. They had pleaded not guilty. 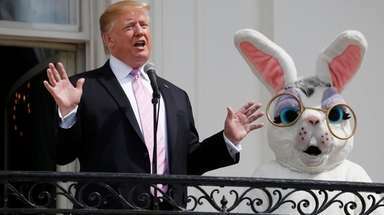 Singh in his first days on the stand had said he learned as a young businessman that he had to join the “family” of local Republicans if he was to flourish as a restaurateur. “If you know the people, the right thing would be done by you,” he said March 15. He testified that he campaigned for Mangano, who was elected to the county legislature in 1995, and that he contributed $5,000 in 1997 to Venditto’s successful bid for town supervisor. Prosecutors stressed that Singh’s bribes to Mangano began when Mangano won the county executive seat in 1999. Defense attorneys said what prosecutors represented as bribes were actually gifts from Singh to Mangano, friend to friend, or gifts that Mangano did not ask for. They cast Singh as a criminal and a liar whose testimony served only to spare him time behind bars. Defense attorneys made several impactful moves in the trial. Singh was forced to concede that Linda Mangano performed more work for his company than he realized when Carman entered as evidence dozens of work-related emails between Mangano and Singh’s restaurant employees. Carman also noted that the FBI agents who alleged Linda Mangano had lied during her interactions with them had not made verbatim notes of her statements. Also during the trial, Keating played two secretly recorded conversations between Singh and his trusted confidants. In a March 2015 talk captured on an FBI body wire, Singh is heard saying he received “nothing, nothing” from Edward Mangano in exchange for such gestures as hiring his wife. On the stand, Singh responded that he was “in denial” and lying at the time of the conversations. Assistant U.S. Attorney Catherine Mirabile noted that the emails presented by Carman numbered only 40 and are concentrated in a three-month period in 2010, the year Linda Mangano began her job with Singh. New York City Mayor Bill de Blasio also featured in the trial, though he was never called to testify as Carman had suggested might happen. Singh testified that de Blasio knew about Singh’s plan to use illegal straw donors to help get Democrats elected. Singh also said he bribed de Blasio with campaign contributions in exchange for help with Singh’s Queens restaurant. De Blasio has denied illegal or inappropriate behavior and a Manhattan federal probe into his fundraising practices did not result in criminal charges. Among the testimony and evidence that appeared to underscore prosecutors’ case that Mangano and Venditto lived lives that were at least a little more luxurious thanks to Singh was the restaurateur’s description of Nassau County top brass dining during superstorm Sandy recovery efforts on “special food” such as steak, shrimp and veal while the rank-and-file emergency workers had chicken, pasta and London broil. Mangano referenced Sandy’s aftermath Thursday, when reporters asked if he had a message for Nassau County residents. Who’s who in the trialKey figures in the ongoing political corruption trial of former Nassau County Executive Edward Mangano, his wife, Linda, and former Town of Oyster Bay Supervisor John Venditto. Venditto not guilty; jury deliberating on ManganosJurors acquitted former Oyster Bay Town Supervisor John Venditto on all corruption-related charges, delivering a partial verdict in the trial that also includes former Nassau County Executive Edward Mangano and his wife, Linda. 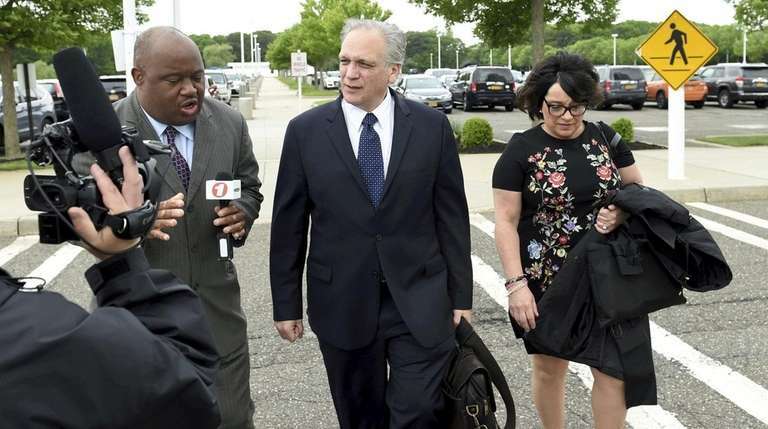 Jurors ask to see footage of Mangano’s front doorJurors considering the federal corruption charges against former Nassau County Executive Edward Mangano and former ... Mangano-Venditto jurors: We need instruction"We cannot come to an agreement on certain items," the jury foreman wrote U.S. District Judge Joan M. Azrack.